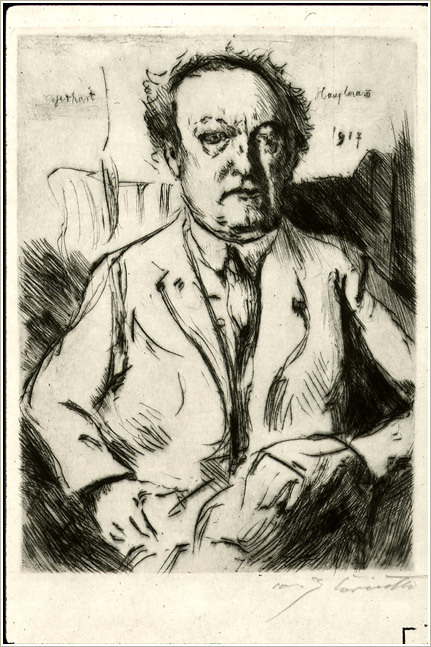 A similar interest is suggested by subsequent acquisitions, for instance Lovis Corinth’s drypoint Portrait of Gerhart Hauptmann (1917). This portrait of the German dramatist, Nobel Prize winner and founder of German naturalism entered the collection in 1965 (fig. 2). While an interest in German culture may have informed the decision to begin the collection, it is only part of the story. The artists known collectively (and somewhat loosely) as German expressionists were active before and during the Nazi rise to power, and as such, their work embodies resistance to the horror that engulfed Germany in the years leading up to World War II. Following the war, anti-German sentiment remained high in Canada and other allied countries, the memory of Germany as the enemy only sharpened by knowledge of Nazi atrocities and the Holocaust. Because many of the German expressionists had used their art work to openly challenge the complacency and hypocrisy of German society in the inter-war period, and many suffered the consequences of their actions during the Third Reich, they represented an important model of resistance. As such, they provided a critical starting point for a process of rehabilitation, a process of reclaiming German history and culture from both the Nazi regime and the memory of World War II. A reminder, if you will, that not all Germans were acquiescent. Although they did not always espouse the same ideas and practices, German expressionists shared a spirit of rebellion. An increasingly crowded, urban and industrialized consumer society was a recurring target for critique by these artists, and an expressionist style was used to convey a sense of deeply felt outrage and protest. Artists such as George Grosz, for instance, targeted both bourgeois society and war profiteers in Germany following World War I. His Ecce Homo series (1923), in the McMaster collection, is a critical and satirical view of contemporary behavior and public morality and a chilling indictment of the atmosphere in Weimar Berlin. Others, such as Ernst Ludwig Kirchner, focused a critical eye on the artificiality, rampant consumerism and anonymity of city life, in contrast to what was considered an idyllic pastoral life in the countryside. Still other members of the movement emphasized creativity and spirituality rather than social or political critique, but in both form and content, German expressionists challenged traditional approaches to representation.